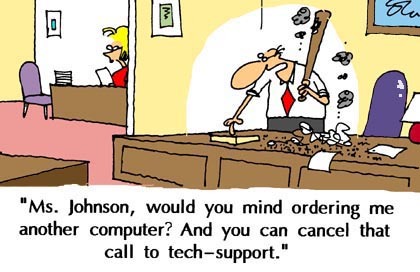 Well, even computer consultants have computer problems every now and then. My hard drive was starting to crash several times each day. Hard drives are nice in that usually they will give a few days warning that they are having some issues. (If only we would heed those warnings!) Well, I did. I installed a new hard drive and re-installed all of my programs. Yes, I had full backups of all my data; and yes, getting back up to speed was relatively pain free for me. The part of re-installing that I have always hated was re-customizing all of my tool bars in my Office programs. I create new icons, I color them in, I add new menu items, etc. Also, If you use Outlook, you are familiar with the fact that when you start to type in an email address, matches come up instantly (this is the auto-suggest feature). Additionally, you can set Outlook up to check certain contacts folders for email address, and also how you like folders to be archived. Well, all of these items and pretty much any option or feature you have enabled in Microsoft Office can be backed up! When you get a new computer, or in my case have a hard drive crash, you can restore everything. In Office XP and 2003 there is a program choice under the Microsoft Tools program folder called the Microsoft Office Save My Settings Wizard. If you have Office 2000 there are other third party software solutions available. You just select the file name and location to save the file. Then use the program and select the file when you wish to restore. It couldn't be easier and I am amazed at how many things, that I needed to previously recreate, came back- even my custom dictionaries! Give it a try now and back up these settings before your drive crashes. Many of my clients know that I was a long time supporter of McAfee VirusScan. Sometime around version 7.0 of their product, they began installing something called the McAfee Security Center. This center was a useless piece of software designed to give you a one stop point to find out how secure your computer was. It would give ratings on a scale of 1 to 10 for items such as firewall, spam, virus protection, etc. It was a major piece of "bloatware" (large useless programs). Around version 8.0, you could not uninstall it. What was the worst part of the program? The ratings only worked if you had their software! If you had pieces of software that were in fact rated better than McAfee's version, you would still get ratings of 1-2! Around that point is when I started to sell Norton AntiVirus instead. These days, McAfee can't give their software away, I wonder why? Well guess what? Norton Antivirus 2006 (or any suite that contains it) now comes with the, you guessed it, Norton Protection Center. Exact same piece of "bloatware", works the exact same way. Considering how the industry bashed McAfee for doing this (and how quickly their market share dropped), I can't believe that Symantec did this. Fear not, I am here for you! I have found out how to disable this piece of software after you install Norton Antivirus 2006. The Norton Protection Center runs as a service in Windows XP. Simply click on Start/ Run and type in "services.msc" This will bring up the Windows services folder. Locate the Norton Protection Center service and double-click. Choose the startup type of "disabled". The service will not load when you restart your computer. I have seen no adverse affects from doing this, and have seen lots of happy peers on the internet. If that is not enough from Symantec, here is another bone of contention: When you renew your subscription to any Symantec product, or if you buy your software online from Symantec- they keep your credit card information! When it is time to renew your subscription, they do it automatically! I am sure that there is some way to ask them to not keep your information, but I think I'll choose some other options if I can. You're not alone, Jack--- many people are reporting this. Unfortunately, there doesn't seem to be an easy fix--- but it *is* fixable, with a little effort. First, get updated with *all* current service packs, which close several known holes in XP that can be used by the cluster of hostile agents that manifest themselves in the WinFixer problem. No fix will work until these holes are closed. Next, turn off System Restore, GoBack and similar lightweight backup tools, so they won't re-infect you by restoring bad files after you clean 'em out. The above will probably lead you to a clean system, but if not, as a last resort, save your data files to a safe location and restore your system from a backup or image made prior to the infection; then restore the newly-saved data files. Q. Please help me! WinFixer 2005 pops up repeatedly on my computer. I cannot get rid of it. It is driving me crazy. How do I delete this thing? A. I wrote about WinFixer 2005 in August. But I'm getting another spate of complaints about it. So I wanted to address it again. WinFixer 2005 supposedly fixes lots of little problems in Windows. I found numerous sites on the Web that say it does no such thing. According to these sites, including the security firm Symantec, WinFixer 2005 actually uses social engineering to trick people into buying it. WinFixer 2005 badgers people with pop-ups, warning that there are hundreds of problems on their computers. They are encouraged to buy the product, which costs $40. If you are afflicted with this problem, first try to delete WinFixer 2005. Click Start>>Control Panel. Double-click Add or Remove Programs. Find any reference to WinFixer 2005 in the list and click Change/Remove. Next, run anti-spyware programs. On my Web site, you can download Ad-Aware, Spybot-Search & Destroy, Windows AntiSpyware and Spy Sweeper. All are free except Spy Sweeper (my favorite), which is $30. I'd try them all. WinFixer 2005 really embeds itself. If WinFixer 2005 reinstalls itself, you need a custom HOSTS file. A HOSTS file probably will block it from accessing its computers over the Internet. The HOSTS file that I use blocks several WinFixer 2005 addresses. You can find much more information about WinFixer 2005 on the Internet. It makes many entries in the Windows Registry. Symantec has a thorough description. You may have to delete Registry keys manually. Before editing the Registry, back it up. I have directions on my site. Here's a fun test of your reflexes. Try to catch the sheep before they run across your page.